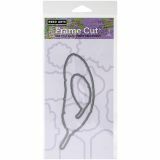 Hero Arts Frame Cuts Dies - Hero Arts-Frame Cuts Dies. Enjoy elegant and stylish frame dies in intricate designs. These American made, precision etched metal dies are ideal for cutting paper with most die-cutting machines. This package contains Elegant Feathers: a set of two dies. Coordinates with CL407. Made in USA.